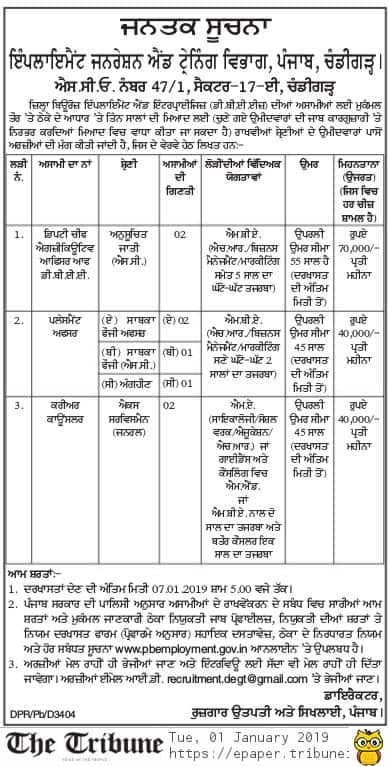 Employment Generation and Training Centre, Punjab (Chandigarh) have recently given notification of 10 Deputy Chief Executive Officer, Placement Officers, and Career Counselor Vacancies on the contract basis. You can apply for the Employment Generation Department Punjab Recruitment 2019 on or before 08.02.2019. Punjab Employment Generation Department Recruitment 2019-20 latest notification is out. As per the Notification, there are 10 Deputy Chief Executive Officer, Placement Officers, and Career Counselor Vacancies. The educational qualification is the MA and MBA degree. The upper age limit is 45 and 55 years as per the vacancy. If you are looking for Jobs in Punjab Employment Generation Department then this article is going to be very helpful for you. Name of Department: Employment Generation and Training Centre, Punjab. Last Date: 08 February 2019. Deputy Chief Executive Officer: MBA (HR/ Business Management/ Marketing including 05-years of experience. Placement Officer: MBA (HR/ Business Management/ Marketing including 02-years of experience. Career Counselor: MA (Sociology/ Education/ Social Work/ HR) M.Ed in guidance and counseling. Deputy Chief Executive Officer: The upper age limit is 55-years. Placement Officer: The upper age limit is 45 years. Deputy Chief Executive Officer: Rs. 70000/- per month. Placement Officer: Rs. 40000/- per month. Career Counselor: Rs. 40000/- per month. You can send your applications to the department on or before 08.02.2019 up to 05.00 PM. You can check the Punjab Employment Generation Department Result or Interview List from the official website. 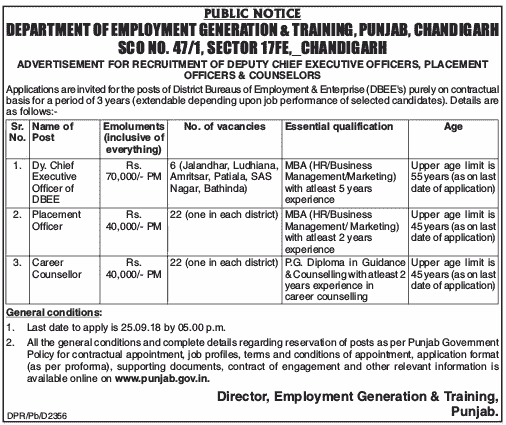 Employment Generation and Training Centre, Punjab (Chandigarh) have recently given notification of 08 Deputy Chief Executive Officer, Placement Officer, and Career Counselor Vacancies on the contract basis. 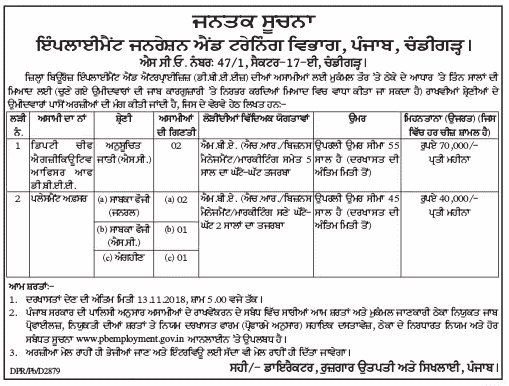 You can apply for the Employment Generation Department Punjab Recruitment 2019 on or before 07.01.2019. Punjab Employment Generation Department Recruitment 2018-19 latest notification is out. As per the Notification, there are 08 Deputy Chief Executive Officer, Placement Officer, and Career Counselor Vacancies. The educational qualification is the MA and MBA degree. The upper age limit is 45 and 55 years. If you are looking for Jobs in Punjab Employment Generation Department then this article is going to be very helpful for you. Last Date: 07 January 2019. Career Counselor: The upper age limit is 45 years. You can send your applications to the department on or before 07.01.2019 up to 05.00 PM. You can check the Employment Generation Department Punjab Result or Interview List from the official website. 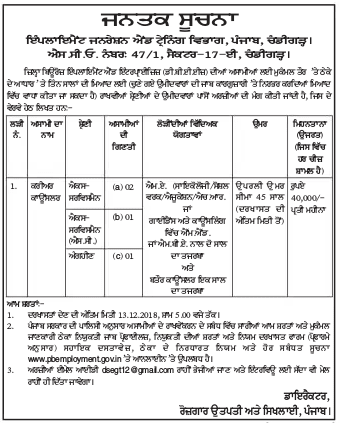 Employment Generation and Training Centre, Punjab (Chandigarh) have recently given a notification of 04 Career Counselor Vacancies on the contract basis. You can apply for the Employment Generation Department Punjab Recruitment 2018 on or before 13 December 2018. Last Date: 13 December 2018. Punjab Employment Generation Department Recruitment 2018-19 latest notification is out. As per the Notification, there are 04 Career Counselor Vacancies. The educational qualification is the MA degree. The upper age limit is 45 years. If you are looking for Jobs in Punjab Employment Generation Department then this article is going to be very helpful for you. Educational Qualification: MA in Social Work/ Psychology/ Education/ Human Resource. OR M.Ed. in Guidance and Counseling or MBA with 02-years of experience. Age Limit: The upper age limit is 45 years as on the last date of the application. Age Relaxation: As per the government rules. Location of Job: Chandigarh (Punjab). Salary: Rs. 40000/- per month. Selection Process: The selection process is going to be on the basis of interview. Application Fee: No application fees. How to Apply: You can send your applications to the department on or before 13.12.2018. Result: You can check the Employment Generation Department Punjab Result or Interview List from the official website. Employment Generation and Training Centre, Punjab (Chandigarh) have recently given notification of 06 Deputy Chief Executive Officer of DBEE and Placement Officer Vacancies on the contract basis. You can apply for the Employment Generation Department Punjab Recruitment 2018 on or before 13 November 2018. Last Date: 13 Nov 2018. Punjab Employment Generation Department Recruitment 2018-19 latest notification is out. As per the Notification, there are 06 Deputy Chief Executive Officer of DBEE and Placement Officer Vacancies. The educational qualification is the MBA degree. The age limit is 45 and 55 years. If you are looking for Jobs in Punjab Employment Generation Department then this article is going to be very helpful for you. Deputy Chief Executive Officer of DBEE: MBA (HR/ Business Management/ Marketing with 05-years of experience. Placement Officer: MBA (HR/ Business Management/ Marketing with 02-years of experience. Deputy Chief Executive Officer of DBEE: The maximum age limit is 55 years as on the closing date of application. Placement Officer: The maximum age limit is 45 years as on the closing date of the application. Deputy Chief Executive Officer of DBEE: Rs. 70000/- per month. How to Apply: You can send your applications to the department on or before the due date. Department of Employment Generation & Training, Punjab, Chandigarh has recently given a notification of 22 Career Counsellor (One in Each District) Vacancies on the contract basis. You can apply for the Employment Generation Department Punjab Recruitment 2018 on or before 06 November 2018. Last Date: 06 November 2018. Punjab Employment Generation Department Recruitment 2018-19 notification is out. As per the Notification, there are 22 Career Counsellor (One in Each District). The educational qualification is the MA (Psychology/ Social Work/ Education/ HR) or M.Ed.in Guidance & Counseling or MBA. The upper age limit is 45 years. If you are looking for Jobs in Punjab Employment Generation Department then this article is going to be very helpful for you. Educational Qualification: MA (Psychology/ Social Work/ Education/ HR) or M.Ed.in Guidance & Counseling or MBA with 02-years of experience and 01-Year experience in counseling. Age Limit: The upper age limit is 45 years as on the last date of application. Location of Job: All State of Punjab. How to Apply: You can send your applications for the Career Counselor Vacancy along with the self-attested supporting documents must be submitted as the soft copy to the mail id hq.degt@gmail.com before 06.11.2018 up to 05.00 PM. Kindly mention your mobile number and email id on the application form. Department of Employment Generation & Training, Punjab, Chandigarh has recently given a notification of 50 Dy. Chief Executive Officer of DBEE, Placement Officer, Career Counsellor Vacancies on the contract basis. You can apply for the Employment Generation Department Punjab Recruitment 2018 on or before 25 September 2018. Punjab Employment Generation Department Recruitment 2018-19 notification is out. As per the Notification, there are 02 50 Dy. Chief Executive Officer of DBEE, Placement Officer, Career Counsellor Vacancies. The educational qualification is the MBA and Post-graduation diploma. The upper age limit is 45 and 55 years. If you are looking for Jobs in Punjab Employment Generation Department then this article is going to be very helpful for you. Last Date: 25 September 2018. Dy. Chief Executive Officer of DBEE: MBA (HR/Business Management/ Marketing) with minimum 05-years of experience. Placement Officer: MBA (HR/ Business Management/ Marketing) with minimum 02-years of experience. Career Counselor: PG Diploma in Guidance & Counseling with at least 02-years of experience in the career counseling. Age Limit: The upper age limit is 45 years for the Placement Officer & Career Counselor and 55 years for the Dy. Chief Executive Officer. Dy. Chief Executive Officer of DBEE: Rs. 70000/- inclusive of everything. Placement Officer: Rs. 40000/- inclusive of everything. Career Counselor: Rs. 40000/- inclusive of everything. How to Apply: You can send your applications complete in all respect to the department on or before 25.09.2018 by 05.00 PM.